The life and times of a reiki master and massage therapist. Well, it's been nearly a month since I've posted anything. Since then, I've taken a continuing education course in infant massage, offered free chair massage at a MetroMoms event, completed two knitting commissions, and attended a natural building workshop. Whew! The infant massage course was lots of fun. We learned about studies proving that children thrive when held and touched as infants, and practiced the technique on dolls. One of the students had her husband bring her toddler nephew, who had been receiving massage since he was a baby. He was so cute! He would sit still for a little while, then jump up to go pounce on his uncle, or to play with one of the dolls. Then, when he was ready, he would lay back down for a little more work. The MetroMoms event was allot of fun, too. It was a "move and be healthy" type of thing, held at a Wiggles Play Center. Not only did the kids get to play on the playsets, but the moms participated in a hula-hoop contest, while the dads had to feed and change a "baby" - one handed! It was so funny to see grown men get so competitive over baby bottles filled with water and diapers that just would not come off of the doll. It was all in good fun, though. If you are interested in my knitting, you can check it out at themerryknitter.blogspot.com. I've knit a Christmas sticking and three pairs of baby booties this lately. I'll start on a sweater this month. The natural building workshop was so much fun. We built the walls of a small cabin out of cob, a traditional building material in the UK made up of sand, clay, soil, and straw. You add water and viola, you have...well, thick mud with straw in it. But, when it is stacked and squished into the shape of a wall, it dries rock had and can last for hundreds of years. You know those white houses with the thatched roofs in England? Those are cob. You can check out the slide show of some of the pics and video I took during the workshop below. Well, it's been a lovaly Mother's Day. 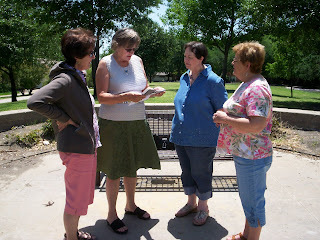 My mother and I went to a Standing Women event at a local park. If you don't know, Standing Women is a movement where women (and men) get toegether to stand to bring attention to the issue of creating a safe future for the world's children. We women of one country will be too tender of those of another country to allow our sons to be trained to injure theirs. From the bosom of the devastated earth a voice goes up with our own.It says "Disarm, Disarm! The sword of murder is not the balance of justice." Wow, huh? It was so relavent to today that it just blew me away. And then, after all that serious talk of war and peace, and children and mothers, we noticed this on the pavement below our feet. 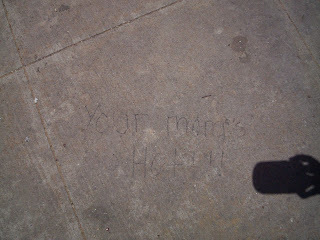 You can just barely see it, but someone had scribbled the words "Your mom's HOT!!" I have to say, it gave me a fit of giggles. I've been thinking about what to write in today's self care blog. I've had several things run through my head. Relieving shoulder tension and low back stretches were the two at the top of the list. But, to be honest I'm really tired. Literally. I had trouble getting to sleep last night and I feel whupped. Basically less sleep = more stress. When we don't sleep we can be cranky, forgetful, and less able to think clearly. And stressed. And prolonged stress dows nasty things to the body. Every thing from weight gain to compromised immune system has been linked to stress. So, so your body a favor and take time to get your rest. It'll thank you for it. If I had a nickle for every time I've heard, "I've got allot of tension in my neck and shoulders," I'd...well, I'd have allot of nickles, that's for sure. We store so much stress in our neck and upper shoulders, especially if we are heavy computer users (or work with our hands, or carry a child around allot, or...the list goes on and on.) It's really important to keep the neck muscles flexible. It not only feels good to stretch them, but it can help prevent or relieve neck pain and headaches caused by muscle tension. Allot of times, you see people stretching their neck by rotating their head around in a circle, but this is not always the safest option. It can aggravate neck injuries, and as it's really easy to stretch too far with this method you could even create a new one. When I stretch my neck, I like to imagine that my head is smack dab in the middle of a compass. North is right in front of me, east is my right shoulder, south behind me, and west my left shoulder. I usually sit in a chair with a low back, close my eyes and take a nice deep breath. As I exhale, I slowly let my chin drop towards my chest (towards north.) As my head lowers, I'm aware of the stretch in the back of my neck and I am conscious not to stretch to far. If I feel pain, I let up a bit. I take another breath and return my head to center with the exhalation. I then follow this process for the east point on the compass, bringing my right ear towards my right shoulder. I can feel the stretch on the left side of my neck and upper shoulder and I'm conscious not to let my right shoulder "help" by lifting up to touch my ear. I then take another breath and return to center. I repeat that for both the south and west points. If I'm feeling really tight, I'll incorporate the in between points (north & south east and north & south west) into the routine. To finish off, I'll slowly turn my head to look over each shoulder, making sure that my shoulders stay still, not coming forward to try to meet my chin half way. So, they next time you find yourself imitating a scared turtle (head tucked down and shoulder up around your ears) you may find taking a few moments to stretch those neck muscles can help a bunch. Please listen to your inner guidance when stretching the neck, though. No over stretching, and don't push it if you feel any pain. When done correctly, a neck stretch is a great way to reduce allot of that stress tension we generate on such a regular basis. Hope it helps! This information is not intended to diagnose or treat any disease or disorder. Please consult your doctor if you have any questions about starting any exercise or stretching routine. The breath is the most important stepping stone on the path to wellness. Learn to harness the power of the breath and you're on your way to creating a new you. This may sound like an exaggeration, but just the simple act of taking a deep breath has an immediate effect on the body. A deep breath from the belly stimulates the parasympathetic nervous system. The parasympathetic is the opposite of sympathetic, or "flight or fight" reaction. Instead of getting the body ready to handle an emergency, it's the body's "all clear" signal. The heart rate slows down and digestion is stimulated, giving it the nick name "rest and digest." The best way to take a deep breath is with your belly, or more precisely, your diaphragm. Place a hand on your belly and slowly inhale, pushing the hand out and away. Now relax and exhale slowly, feeling the tension drain out of your muscles and noticing how your hand moves back to the starting point. Once you've gotten the hang of it, you can drop the hand and take a few belly breaths when ever you feel the need to be calm. Remember to inhale and exhale slowly. We're trying to relax here, not huff and puff and...well, you get the picture, I'm sure. So, try the belly breathing next time you feel tense. Just a few breaths should do the trick. And remember what they say, "Practice makes perfect." The more you concentrate on letting the tension just drain away, the easier it will become. The breath becomes the signal to let the body know that it's ok to relax now. Nifty, huh? A Mississippi native, putting down roots in Texan soil. A massage therapist and reiki master. A knitter and lover of all things fiber. Get the My Articles widget and many other great free widgets at Widgetbox!